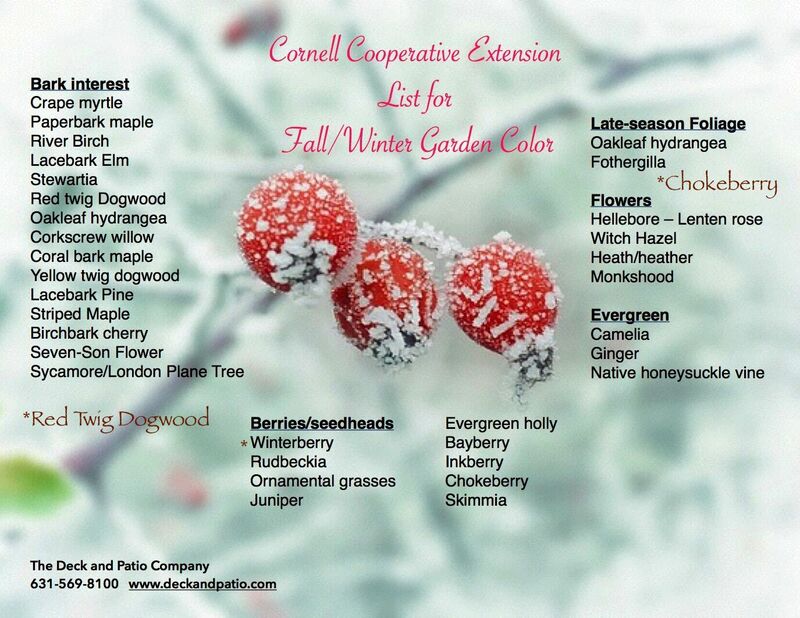 Around this time last year, our blog highlighted some great ideas for fall/winter garden color in the Northeast. Now that our evenings once again have a chill in the air, we thought it the perfect time to update that information. 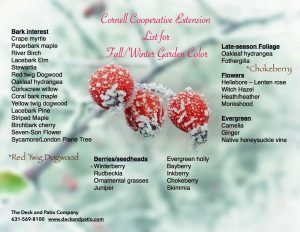 The previous blog included a fairly comprehensive list of what would “lift winter doldrums with outdoor color and texture” — information that we put together with the help of Sandra Vultaggio, Horticulture Consultant at the Cornell Cooperative Extension in Riverhead, NY. 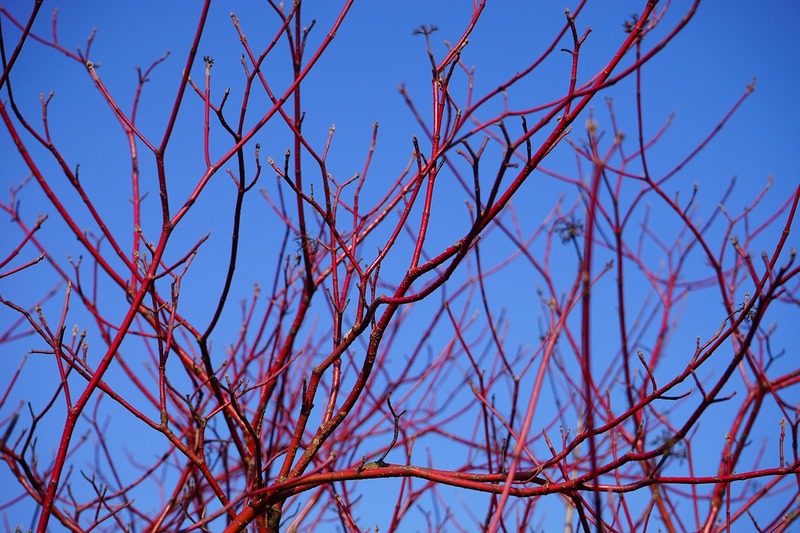 Working with her again, we’re updating the list by highlighting different species of shrubs and have even included a new beauty not on last year’s list at all — the glorious Red Twig Dogwood. 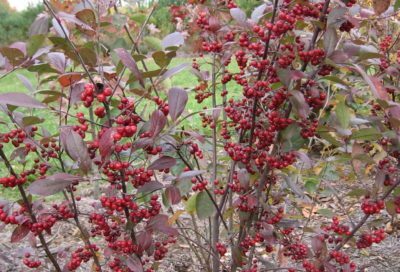 Another gorgeous shrub that was actually on last year’s list under “Berries and Seedheads,” but not highlighted with a photo and further info, is the stunning Chokeberry. We also think that it deserves to appear under the list’s heading “Late Season Foliage” because of its lovely red fall foliage. Plus, during spring, the Chokeberry offers up delightful light pink flowers. 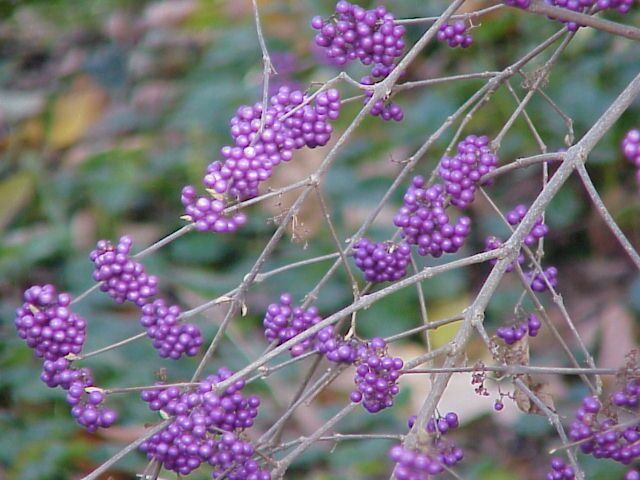 Of course, we’re really highlighting it because in winter it provides dramatic color through its berries. 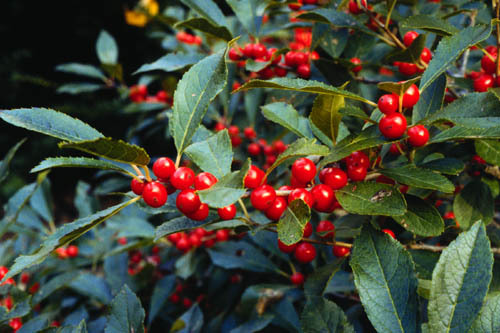 Another beauty we are highlighting this year is Winterberry Holly, Ilex verticillata, which happens to be one of Vultaggio’s favorites. “Also a native, its bright red fruit is eaten by more than 48 species of birds. It is also a good choice for a shaded site,” she says. Making our list for the first time, this bush has a reputation for attracting bluebirds along with other birds and butterflies. It grows as both a perennial and as an ornamental, and will be most enjoyable after about 3 years. Note that it likes partial sun and lots of water so it’s great around water gardens — something Deck and Patio specializes in (ahem), so, naturally, it’s a favorite of ours. 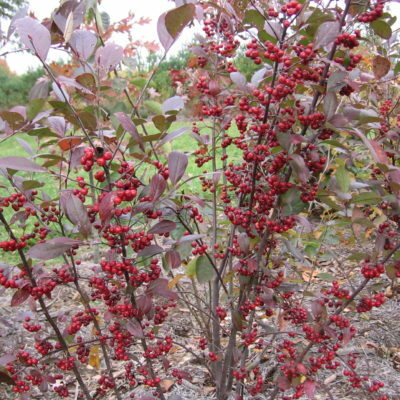 The beautiful chokeberry requires only medium moisture with full sun to partial shade. And don’t forget its stunning fall foliage. 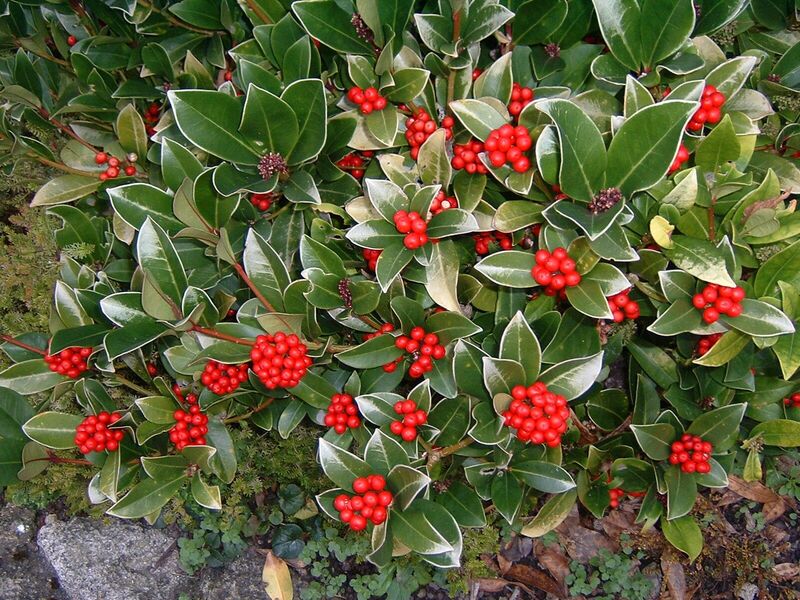 This dramatic and colorful bush is from a species of the deciduous holly family and is native to the Northeast. A slow grower, it loses its leaves each autumn. And, birds love the berries…what more need be said. For a second year in a row, The Deck and Patio Company has been invited to Tennessee to assist Peek Pools and Spas in a spectacular pool project that will be the focus of an upcoming episode of HGTV’s popular television show, Pool Kings. 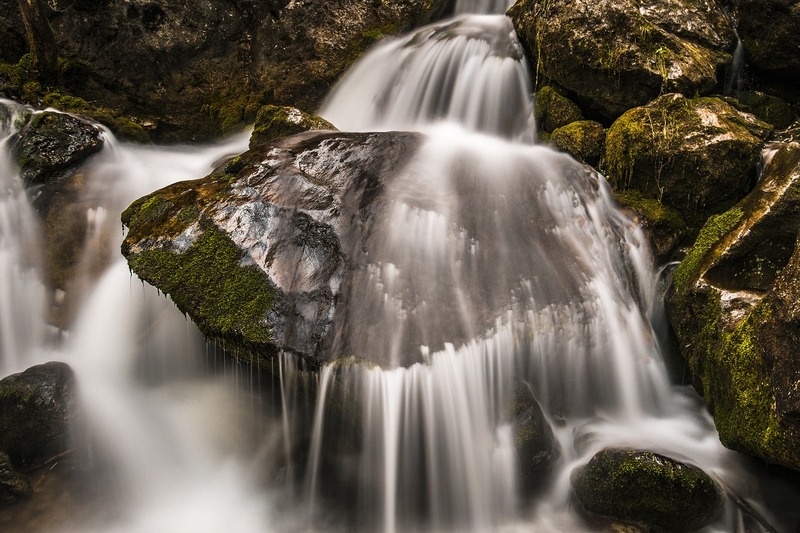 As water feature specialists, we have been installing the pool’s waterfall/stream and grotto area situated on a large shelf at the back of the pool. In addition to the waterfall/grotto amenities, two unique fire and water features will add drama to the left and right of the main waterfall. “This past Tuesday, we worked on setting the rest of the boulders on the shelf and Wednesday we worked on the stream area that feeds the main waterfall,” says Deck and Patio’s Bill Renter. 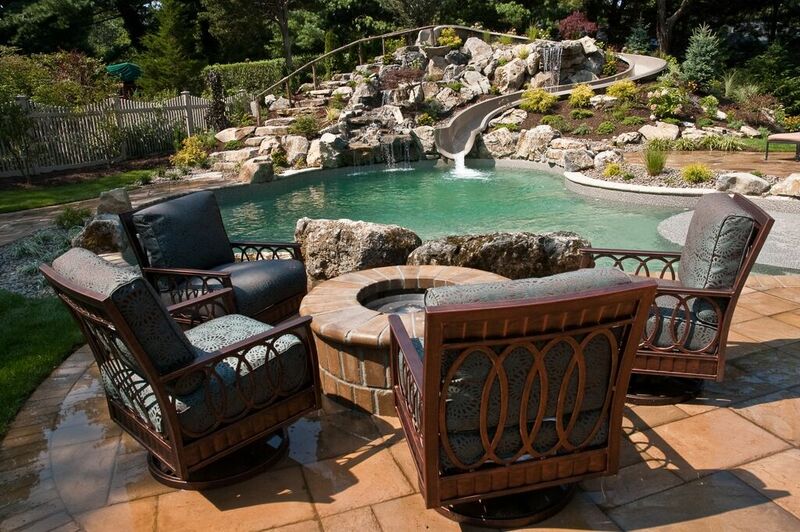 One of Deck and Patio’s award-winning Long Island swimming pool projects, with a serpentine slide and waterfall, — a project that required installing a lot of large natural stones — came to the attention of Peek Pools and HGTV last year. 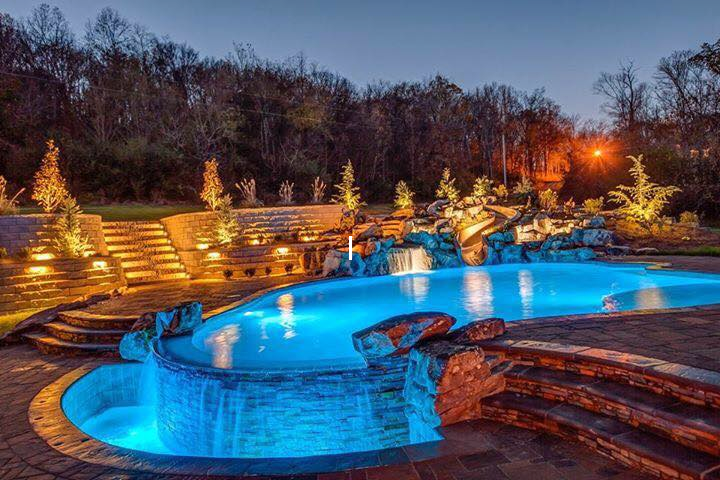 “Last year’s project was in Nashville and we installed the waterfall for a magnificent pool that aired on Pool Kings last season,” says Bill. 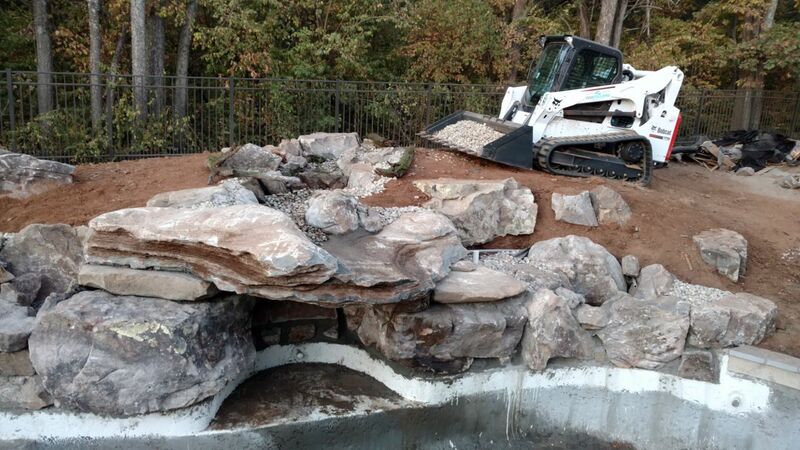 This year, we were called back to create a special water feature for a pool being built in Franklin, Tennessee. The following video shows the early stages of Deck and Patio fixing in place three key rocks that will form a grotto area. The rocks positioned on either side of the grotto each weigh 4,000 pounds and the connecting stone, or spill stone, is 6,000 pounds. 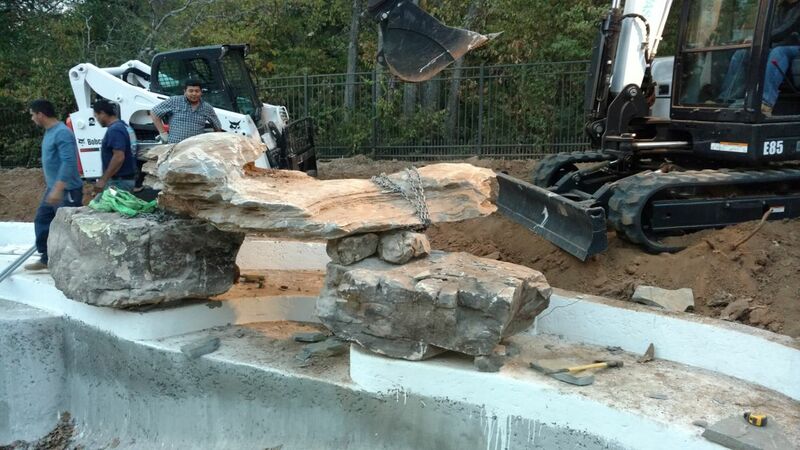 It took two machines to be able to lift in place three key rocks that will form the foundation for the grotto/waterfall area at the back end of a new swimming pool. Here you see more stones added. 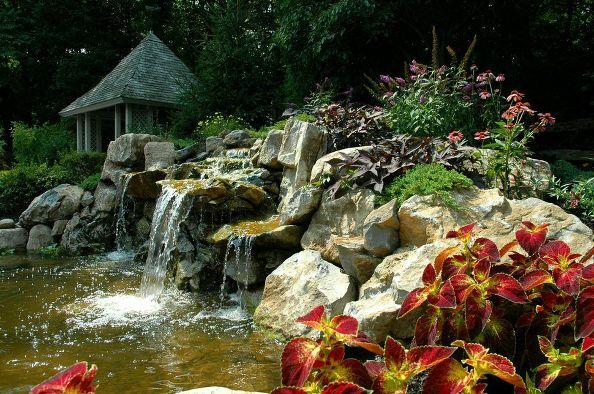 You’ll have to use your imagination to picture the project finished, complete with soil, flowers and ground cover in and around rocks, and water spilling over the grotto with two large fire features on either side. Happy imagining…that is until the Pool Kings episode for this HGTV project airs. We’ll keep you posted. We are not alarmists at The Deck and Patio Company, but our job requires that we pay attention to credible weather forecasts. And according to Accuweather, the Northeast may be in for an extended snowy winter, stretching into spring of 2017. 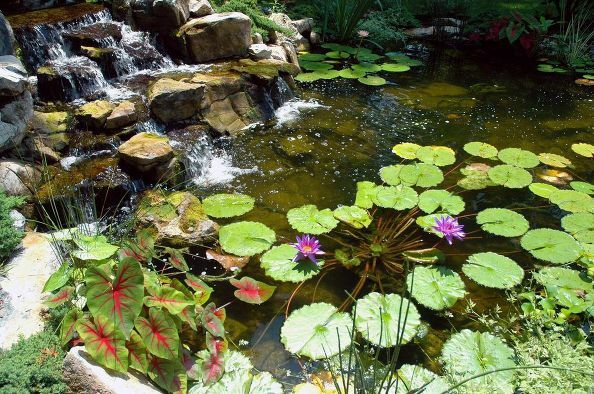 If you have a backyard pond, there are a few things you can do to get ready for this onslaught. 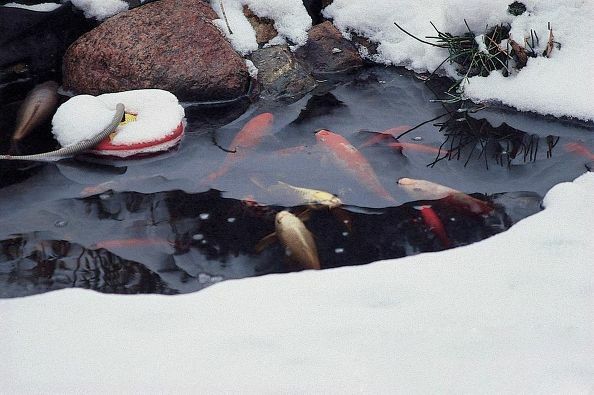 First, let’s deal with the misconception that you can’t leave your fish in the pond during winter months. Actually fish do just fine in winter. They go dormant and hibernate. 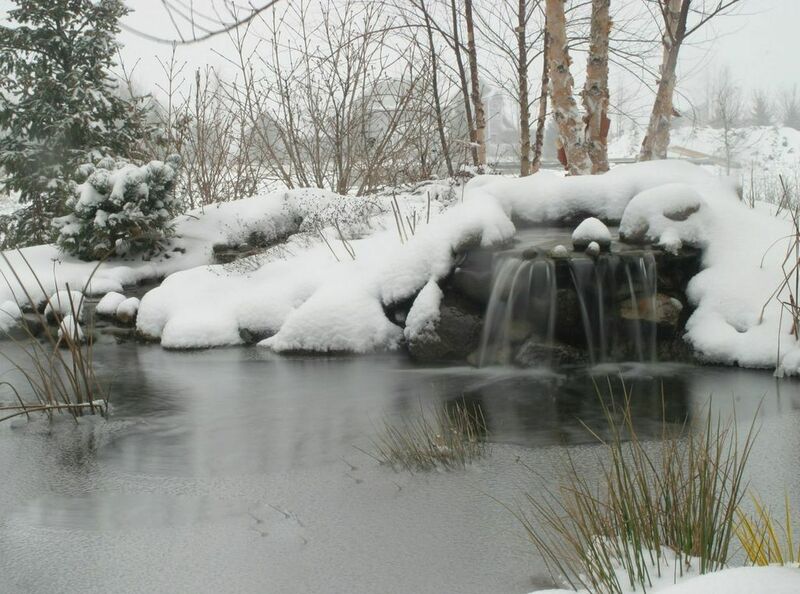 However, our pond expert, Bill Renter, does add that it’s well to be especially alert to their needs once water starts to freeze. 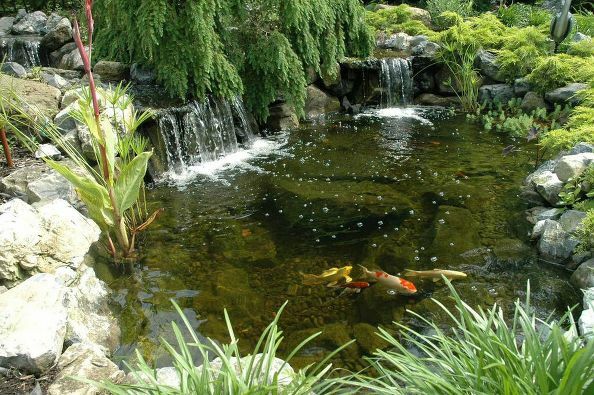 Should ice, for example, completely cover your pond, the fish could become starved for oxygen. These things done, Mother Nature will do the rest. The fish will spend the entire winter hibernating at the bottom of the pond, or in a cave designed for this, and then will slowly wake up as the water warms in the spring. The fish do not need to eat during this time and, in fact, shouldn’t be fed at all. We’ve included in our photo captions below more tips on preparing your pond and fish for winter and how to watch over it all. Happy ponding. Before winter sets in, carefully look over your plants and remove any dying material. These materials rot and build up poisonous gases that can’t escape through ice when it forms. Such conditions might mean the koi are no longer simply hibernating, but are in a dangerous state of torpor. This pond has been cleared of excessive plant material and ice does not cover over the pond so the fish are happily hibernating. 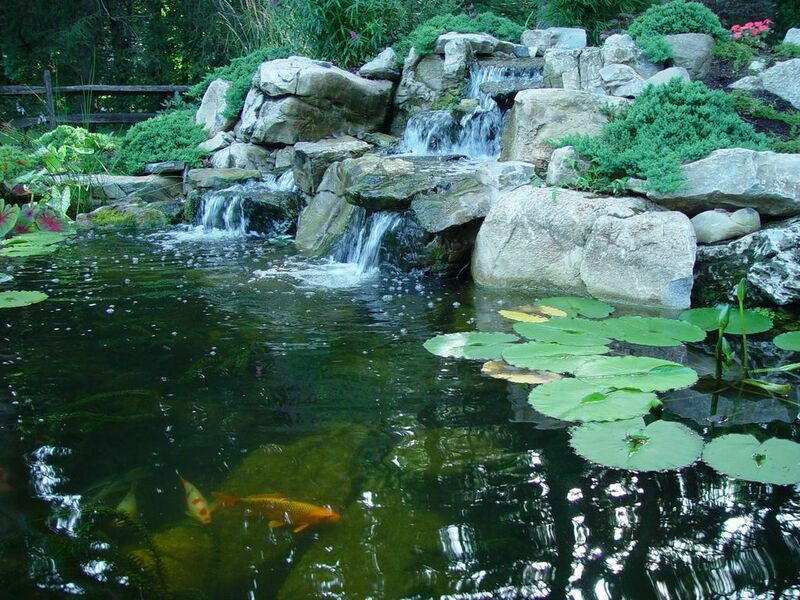 Ask your pond designer/builder to create a small cave, or caves, where the fish can hide from predators in warm weather, and where they can also lie dormant during the winter months. Caves are easily made from the way rocks are positioned in and around the pond.